It also requires an API gateway service to manage the flow of APIs between and from an internal-to-external environment, and all of this needs testing tools that can map how the APIs call and respond to make sure there are no glitches in the flow of the microservices composability. So API Ops emerges to allow the enterprise to focus on the API design, drop in external functionalities, run the workflow tests, and manage gateway tasks. Alex Salazar, CEO of identity and user management service Stormpath, has said that in the past six months, he is increasingly hearing customers ask about microservices. Stormpath offers identity access and user management services via an API that can be integrated directly into an application. In a sophisticated application development, Salazar said, dev teams don’t want to cultivate complex security skills in-house. “If you get your API wrong the first time around, it is really expensive to fix it” — Alex Salazar. Salazar said that dev teams working with microservices and APIs know the focus needs to be on their API design: “If you get your API wrong the first time around, it is really expensive to fix it,” he said. Which is why interest in outsourcing the security provisions is growing. 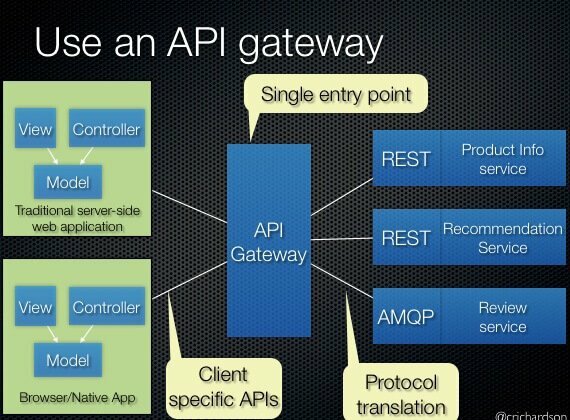 Chris Richardson, one of the original founders of CloudFoundry and author of the Microservices.io website, writes that the microservices design pattern requires an API gateway. 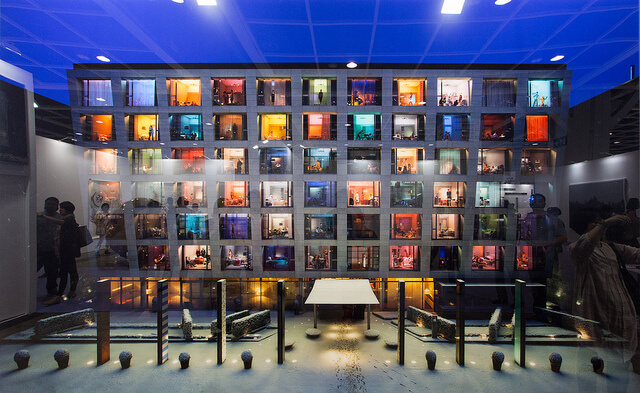 “The granularity of APIs provided by microservices is often different than what a client needs,” he explained. “Microservices typically provide fine-grained APIs, which means that clients need to interact with multiple services. For example, a client needing the details for a product needs to fetch data from numerous services.” An API gateway creates a single entry point for all clients. And that is where the API Ops issue comes into play. Seeing the growth of how Stormpath is used as the identity and user authentication process in a microservices architecture, Salazar has worked to create a new partnership with 3scale, an API gateway and management service provider. Their new partnership means there is now a simple code snippet available on Github to allow developers to integrate a complete identity layer into their web and mobile applications. Over the past six months, Abhinav Asthana has seen this rise of external and internal API use as part of a microservices architecture. As CEO and Founder of the API Ops tool Postman, he steered their product from a browser plug-in to a more fully fleshed out lifecycle tool aimed at helping developers better understand how APIs are consumed in an application workflow. The tool has been taken up by internal teams who want to group their APIs-as-microservices usage, by external developers who want to test API products before integrating them, and — according to Abhinav — has even allowed businesses to define the borders of microservices components better within their architectural map. 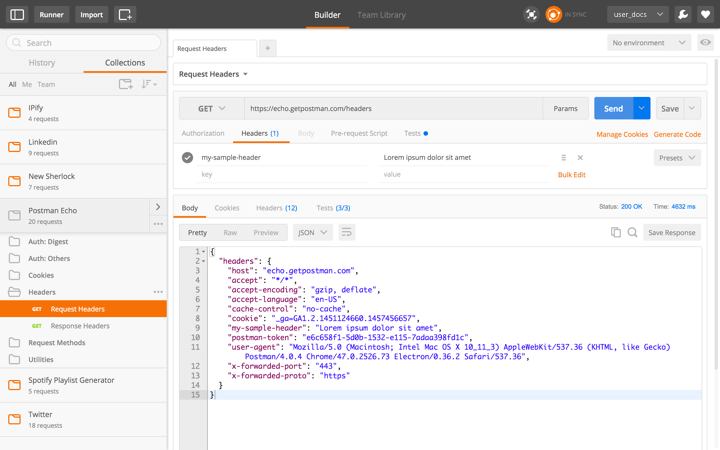 Postman allows users to run API queries with parameters to understand better what data response they will receive. 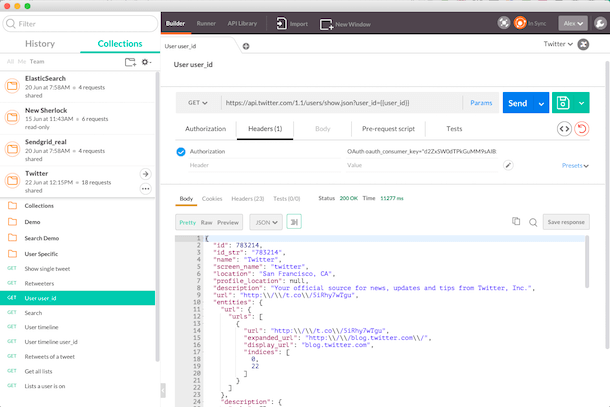 Postman most recently created a feature called “Collections” which allows users to collate all the information they need about the APIs they are consuming in one place. Asthana said that API consumers often need to consult a variety of media when creating their workflow that may include an API call, some transformation of the data, and then the use of that in the a subsequent API query. “Every API publisher provides tutorials, blog posts, and documentation. It is not that these workflows are not created, it is just that the workflow design is not published in a shareable form,” Asthana said. One banking architect I spoke to recently described this sort of situation when using Amazon’s API Gateway, Lambda and DynamoDB. While he lauded the documentation from Amazon, the difficulty came when he was trying to integrate a workflow that moved data amongst the three services. He points to an example of using the console in Amazon API Gateway and importing the API he had created using Lambda. But then when trying to call the API, Lambda returned an error message. The knowledge gap occurred with integrating two Amazon services and not realizing he needed to add the Lambda token to the console workflow. That is exactly the sort of problem that Postman can help solve, by letting end users bundle all the documentation and testing tools from a variety of APIs into the one collection, including their notes, so that can be shared with their internal teams who might be building applications of such a proof of concept. Tools like Postman are also being used to encourage API consumers to be a part of the API Ops community. Postman, for example, has the “Run in Postman” button that helps API providers integrate the testing tool directly into their documentation pages, in the same way that consumers are encouraged to track API changes using the API Changelog widget, or clone an API using the StopLight button. Bliss said there was “some uptick” in developer engagement on the day of launching the “Run in Postman,” but it is too early to see a huge rise in interaction. Meanwhile, startups like Cronofy are also offering Run in Postman on their developer pages. Cronofy offers an API that lets users maintain any calendar app in a bi-directional, always-synced, realtime integration. CEO and founder Adam Bird said they wanted to see whether improving API Ops opportunities for their developer-consumers could increase conversion. Bird is thinking through how API Ops tools like Postman can be used in conjunction with documentation to improve developer uptake. “Copying and pasting sample code is the way many developers start getting to grips with an API,” Bird said. “By having our error reporting recognize when documentation placeholders for things like security tokens were being used, we could more effectively guide new developers as to how to become successful with our API.” Bird said they have seen a “significant improvement” in developers moving from a trial account to making successful integrations thanks to the tool’s availability. While microservices architecture is leading the demand for more internal and external APIs, at the same time, the use of API Ops can help an enterprise better foster a microservices mindset. Salazar said this organizational feedback loop around microservices design has made APIs essential, but at the same time has lessened their conceptualization as the endgame in itself. “Because of mobile and the benefit of microservices, which focuses on building and managing small components instead of a monolithic application, you see teams really struggling with how they are going to integrate their APIs with their mobile products, or between their microservices,” he said. Feature image: “Photography by 金仁淑 Insook Kim (b. 1978 Japan): Saturday Night, 2007 (C-print, diasec) / 313 Art Project / Art Basel Hong Kong 2013 / SML.20130523.6D.14141” by See-ming Lee. Released under CC BY 2.0.